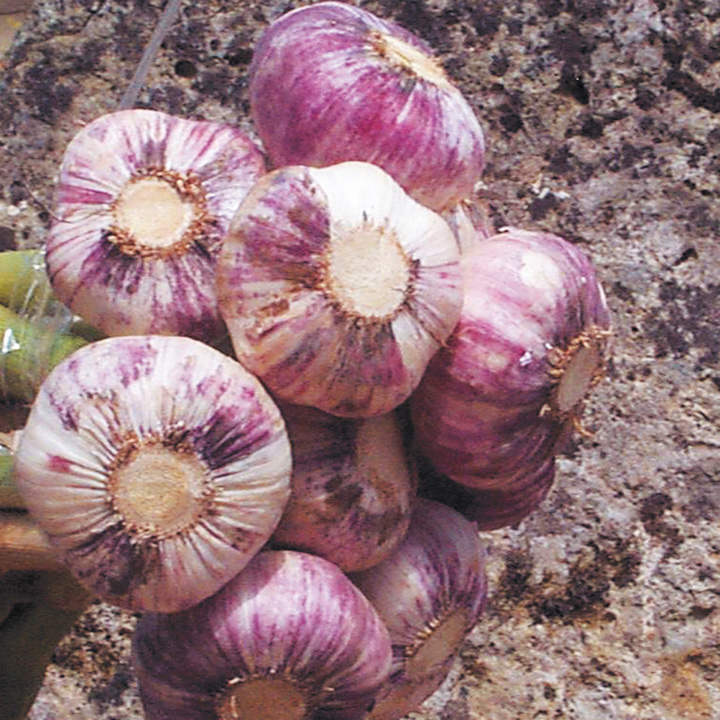 Violet-streaked skin with white cloves and a mild flavour, easily stored and split for cooking. Softneck variety. RHS Award of Garden Merit winner. 250g pack (10-11 cloves per bulb). Virus-free French variety - bulbs come from virus-free stock, ensuring that they'll grow into healthier plants and produce larger harvests! Softneck types – the majority of modern varieties. This type, despite its name, stores for longer and has more numerous but smaller cloves. It doesn't matter whether you're growing htem in pots on the patio or in a half-acre vegetable patch - either way the rewards are great! Now an essential part of so many kitchen gardens, with excellent health benefits (lowering blood pressure, fat and cholesterol levels and combating infections). And they couldn't be easier to grow - simply plant the garlic cloves in autumn, and they'll be ready to lift and dry next July! The sections, or cloves of each bulb should be separated and planted just below the soil surface. Space rows 15-20cm (6-8") apart and allow 10cm (4") between cloves. Lift the crop in mid summer, and store in bunches hung in a dry, airy shed for use in winter.